The VCP (Vietnamese Communist Party) has been increasingly turning to converting national properties into its own cash-generating machines with the help (to intentionally defraud investors AND to abet the VCP stealing money from Vietnamese) from leading investment bankers such as HSCB, Standard Chartered, JP Morgan, Credit Suisse, etc. and big four accounting firms such as KPMG, Ernst & Young, etc. In a country whose average income per annum is less than US$400, it’s quite obvious that working wage-earners can hardly afford to become stockholders of their own corporations. >> Dang Thanh Tam not as rich as people think? 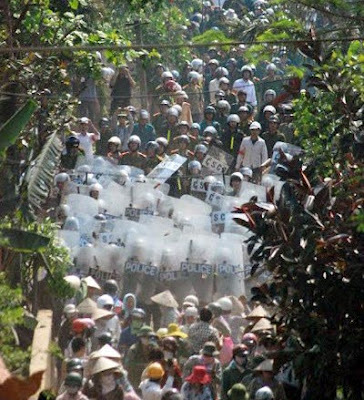 On Tuesday, April 24, witnesses say approximately 3000 police, riot police and military invaded the district of Van Giang in Hung Yen Province, Vietnam. Police used tear gas, flash-bang grenades, clubs and gunfire to disperse approximately 1000 villagers, who defended their land with rocks, sticks, glass bottles and Molotov cocktails. The police were under government orders to seize 70 additional hectares for the development of Ecopark, a new residential and commercial suburban district of Hanoi. The project, which will encompass a total of 500 hectares of seized land, was approved by Prime Minister Nguyen Tan Dung (right). State media admits that as many as 29 villagers have been arrested, though the number is probably much higher. By comparison, in Mui Ne last year, where there was a riot involving as many as 1000 residents, it is believed that secret police hunted down and detained perhaps 100 villagers. Witnesses said that once police secured the land in Van Giang, about 100 bulldozers immediately moved in to destroy the private property. Police brutally beating a Van Giang resident in a Viet Cong cemetery. State-controlled media in the communist country claimed that nobody had been hurt and that only a few hundred police and residents were involved in total. However, video published on YouTube during the attack (a day before state media began reporting, and downplaying, the incident) clearly shows a mob of policemen brutally attacking a bystander. A second video which appears to continue the police beating raises questions of whether police may have eventually murdered the man. Particularly significant is that in this video (one of many from the incident posted online), the police attack the man in a Nghia Trang Liet Si, or a Marty’s Cemetery devoted exclusively to Viet Kong (communist soldiers). Not only does beating an innocent man (perhaps to death) at a Martyr’s Cemetery—just prior to the country’s ‘Reunification Day’ holiday this weekend—demonstrate the Hanoi government’s contempt for the nation’s war veterans, but it also suggests that the government may have plans to secretly destroy such cemeteries as part of the development of Ecopark. A diagram for the proposed development of Ecopark shows the grand size of the project, equivalent to a small city. Sources suggest that Nguyen Thanh Phuong (left), daughter of the prime minister, is an investor in Ecopark, via her company VietCapital Bank. Company documents available online suggest VietCapital is in a partnership with the developer, Vietnam Hung Urban Development (Vihajico). Given the prime minister is the one who signed off on the project and essentially approved the land seizures, things do not look good for Nguyen Tan Dung. The incident, outrageous in itself, may pose the biggest political threat to the future of Vietnam’s Communist Party since national ‘Reunification’. It could also eventually cost the PM his job. A new, lengthy video showing portions of the incident at a distance. This week’s attack on the residents of Van Giang follows the infamous illegal government land seizure in Hai Phong in January. In that attack, Doan Van Vuon fought off about 100 police and soldiers attempting to seize his homestead, using home-made landmines, explosives and shotguns, in a saga worthy of First Blood’s John Rambo. That incident rocked the Communist Party to its core when public sentiment was openly displayed in favour of the victim, Doan Van Vuon. In a rare move, Vietnamese Prime Minister Nguyen Tan Dung was forced, under public pressure, to admit that the government was wrong to take the land from Doan Van Vuon. The Prime minister further called for government reforms in how it handles land seizures. The admission was made a spectacle by the communist country’s state media in an effort to placate the public. The Van Giang incident proves the Prime Minister’s admission of government wrong-doing was insincere. It also shows that Nguyen Tan Dung’s calls for reform were empty propaganda and entirely disingenuous. The Prime Minister and his daughter appear to be tied to the Van Giang incident and may not be able to distance themselves in the eyes of the public. The Van Giang incident is evidence of a willingness for citizens to take up arms against the government in land seizures, on a large scale. The Van Giang incident was well documented with video and photos on the internet. This both serves to embolden further citizen rebellions, as well as disprove government statements which already contradict video and photographic evidence. Government land-seizures and citizen resistance have been a serious issue since the nation’s founding, but few incidents have been so well documented (thanks to the internet) until recently. Many minority groups have lost valuable land—given to ethnic Vietnamese relocated from the north–in areas where the government planned development projects. This is one of many reasons why ethnic groups rioted in the Central Highlands in 2004 and the government sealed off the region at that time. Additionally Catholic parishes across the country continue to protest land seized by the government and never returned. Any individual who aided the US or South Vietnam government also lost their property to the communist regime. This week’s episode in Van Giang is unlikely to be the last such land rebellion. Politically Vietnam is certain to heat up. Unfortunately this may only motivate Hanoi to enforce it’s new Anti-Google and Facebook Decreeall the more forcefully.For more information see stories on the Van Giang incident via BBC, Reuters and RFA. 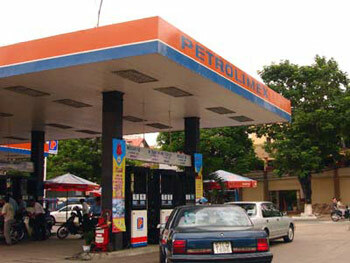 Petrolimex is a state-owned company, meaning every Vietnamese is its stockowner. Yet the money that investment bankers help bringing in will belong totally to the VCP. In other words, Credit Suisse knowingly colludes with the VCP to defraud investors and the Vietnamese people. The Vietnam National Petroleum Corporation (Petrolimex), the country’s second largest State-owned firm in terms of turnover, is scheduled to launch its initial public offering (IPO) on July 28 at the Hanoi Stock Exchange (HNX). The move will be the first step of the equitisation scheme and restructure process approved by the Prime Minister in order to transform the corp. into a group. The corporation’s issuance of shares is aimed at increasing its charter capital, of which the State holds at least 75 percent. Petrolimex plans to auction more than 27.4 million shares to the public with an initial price of 15,000 VND per share. At a road show on equitisation of Petrolimex at the HNX on July 12, HNX Deputy Director General Nguyen Thi Hoang Lan said that as the largest business involved in petroleum, Petrolimex’s shares would be attractive to investors. According to Petrolimex CEO Bui Ngoc Bao, the firm has a large petroleum trading system in Vietnam, from import, storage and distribution with 42 affiliates, warehouses and over 2,100 retail fuel outlets and over 4,000 agents across the country. Petrolimex accounts for about 55 percent of market share among 13 petroleum trading units in the country. June 18, 2011 (LBO) – State-run Vietnam National Petroluem Corporation (Petrolimex) will have an initial public offer of shares in July offering 2.56 percent of its stock to the public, an official said. The firm will have a charter capital of 10.7 trillion Vietnam Dong (519.4mn US dollars) with the government retaining 94.99 percent of the stock after the public issue.Petrolimex, deputy general director Vuong Thai Dung said the company plans to auction more than 27 million shares to the public.Petrolimex competes with state run PetroVietnam in oil and gas. Many state-owned giant corporations still carried out their initial public offering (IPO) as scheduled this year despite the plunging stock market. However, most of them went public quietly, without making promotion packages for the sales. Vietnam Steel Corporation, the country’s biggest steel manufacturer, carried out an IPO on June 10th, selling nearly 10 percent stake. The auction is the largest IPO so far this year. The Hanoi-based steel giant, also know as VNSteel, sold over 39 million out of 66 million shares they had offered at the price of VND10,101 per share. The government retains around 90 percent stake in the Hanoi-based company after the share sales and is expected to reduce it to 65 percent at a later stage, which is expected to be carried out at the end of the year. VNSteel will sell shares to its strategic partners after the last stage in order to raise its registered capital to VND8 trillion (US$400 million). Analysts expect VNSteel would still be content with the result of the IPO, in which, for the first time ever in Vietnam, no one registered to buy nearly 50 percent of the offering amount of shares before the auction took place. Brokers also say only around 300 investors attended the event since VNSteel did not make promoting packages for the IPO. Despite the unexpected IPO, the board of directors of the steel manufacturer remains quite confident about the next sales, of which it will offer 15 percent stake, an equivalent of 120 million shares, to four strategic partners. Japan’s Nippon Steel, US’s Evraz Group, Russia’s Novolipetsk Steel and another Japanese firm Itochu are among foreign steel giants expected to partner up with the Vietnamese manufacturer. State fuel distributor Petrolimex has said it plans to go public next month by selling 27.43 million shares, equal to 2.56 percent of its registered capital of VND10.7 trillion ($512 million). The Hanoi-based company plans to release its prospectus in the first week of July, and hold an investor road show from July 12 to July 15, Bloomberg quoted deputy general director Vuong Thai Dung as saying. Dung said Petrolimex would carry out the IPO despite the bearish stock market as the company wanted to be quickly upgraded to a joint stock fuel group. The company will propose a minimum starting price of VND15,000 per share, which is subject to approval from the Ministry of Industry and Trade, he said in a telephone interview with Bloomberg Monday. Brokers say the amount of shares offered in the IPO is very small as Petrolimex plans to please its shareholders with the auction as scheduled, but still want not to sell too many shares at low prices due to the gloomy market. The Ho Chi Minh Stock Exchange’s VN-Index has declined 10.9 percent this year on concerns that higher borrowing costs will crimp corporate earnings and economic growth. Mekong Housing Bank announced that it achieved approval from the State Bank of Vietnam to carry out an IPO with the minimum starting price of VND11,000 per share. The HCMC-based lender did not say the time of the auction. Mekong Housing Bank is set to sell 31.9 percent of its registered capital of VND4.5 trillion ($225 million). However, analysts remain pessimistic about the equitization plan as share price of many listed lenders are traded below VND9,000. “That is why Mekong Housing Bank hesitates to announce the date it goes public,” said a broker from a HCMC-based securities firm. Petrovietnam Insurance Co , the insurance arm of Vietnam’s state oil and gas group Petrovietnam, said on Wednesday it was in talks to sell a stake to a strategic investor, but did not name the investor. Oman Investment Fund owns 12.6 percent in the Hanoi-based firm, which holds a monopoly on Vietnam’s energy insurance market. PVI Chairman Nguyen Anh Tuan disclosed the talks at a news conference to announce its half-year results. Vietnam allows foreign investors to hold a maximum 49 percent in a domestic company. The company said six-month gross profit rose 13 percent to 220 billion dong ($10.7 million) and accounted for 52.3 percent of the annual target set for 2011. The profit was made as revenues jumped 18.6 percent from a year ago to 3 trillion dong, PVI Deputy Chief Executive Officer Pham Khac Dung told reporters. The company now has a 25 percent share of Vietnam’s non-life insurance market, providing risk coverage and insurance for property in the energy and maritime sectors, he said. Chief Executive Bui Van Thuan said PVI planned to insure Vietnamese fishermen against risks in the South China Sea if their vessels and equipment are damaged by disasters or by foreign ships. “We are going to launch this product in the next month or two,” Thuan said. Vietnam and China have had territorial disputes since late May over resource-rich areas in the South China Sea, which covers the world’s busiest sea lanes and provides rich fishing. PVI shares closed 2.0 percent up at 15,200 dong ($0.9) each on Wednesday. Mekong Housing Bank (MHB), one of Vietnam’s five remaining wholly state-owned lenders, plans to raise at least 710.6 billion dong ($34.6 million) in its initial public offering next month, the country’s main stock exchange said. Ho Chi Minh City-based MHB is expected to auction nearly 64.6 million shares at a starting price of 11,000 dong on July 20, the Ho Chi Minh Stock Exchange said in a statement issued late on Thursday. The shares planned for the IPO represent 14.31 percent of MHB’s registered capital of nearly 4.52 trillion dong. The state will retain a 68.1 percent stake, while MHB can sell 14.34 percent in a domestic auction, 0.56 percent to its employees, 2 percent for the trade union, and 15 percent to a strategic partner, the central bank has said. Vietcombank and VietinBank are Vietnam’s first two state-run lenders to have sold shares and listed on the Ho Chi Minh Stock Exchange. VietinBank has sold a 10 percent stake to the International Finance Corporation. Another state-run lender, the Bank for Investment and Development of Vietnam, or BIDV, said in March it plans to step up its privatisation process. The plan has been on hold for several years. The government has cut Vietnam’s annual credit growth target to below 20 percent this year to curb inflation, from an initial target of 23 percent, after loans jumped 27.65 percent in 2010. Vietcombank is a state-owned company, meaning every Vietnamese is its stockowner. Yet the money that Credit Suisse helps bringing in will belong totally to the VCP. In other words, Credit Suisse knowingly colludes with the VCP to defraud investors and the Vietnamese people. 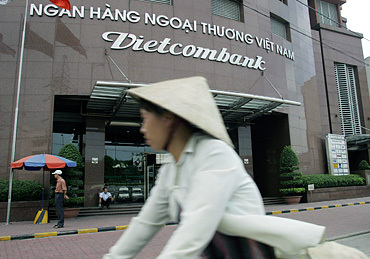 May 17 (Reuters) – Private equity funds, foreign banks and sovereign wealth funds are among those approached to buy a $500 million stake in Vietnam’s Vietcombank , a source familiar with the matter told Reuters on Tuesday. The government of Vietnam had appointed Credit Suisse Group AG as an adviser to sell a 20 percent stake in Vietcombank and invited first round bids by May 23, the source added. Strategic foreign ownership in Vietnam’s banking sector is capped at 15 percent, although it can be increased to 20 percent with government approval. A Vietcombank official, who declined to be named, said the bank was hoping to complete the deal this year or early next year. Credit Suisse declined comment. The source declined to be identified as the matter was not public. The government owns 90.7 percent of Vietcombank, or Joint Stock Commercial Bank for Foreign Trade of Vietnam, the nation’s second-biggest partly private bank by assets. Vietcombank shares ended up 4.8 percent at 30,900 dong on Tuesday, compared with a 1.5 percent fall in the benchmark Vietnam Index . Vietnam is seeing increased interest from buyout firms, drawn to the country’s young population, low valuations and development potential, as competition for assets in China and India pushes them into frontier markets to invest their capital. The proposed sale follows a government decision last month to add more restrictions on foreign investment in Vietnamese banks. Foreign investors seeking to buy 15 percent or more of a state-owned bank must have total assets of at least $20 billion in the year before the purchase, the central bank said last month. Vietnam has five fully state-owned banks: Agribank, BIDV, Mekong Delta Housing Bank, Vietnam Development Bank and Vietnam Bank for Social Policies. Analysts expect the country’s small to mid-sized banks, particularly joint stock banks, to come into focus for investors, as many need to increase capital. [ID:TOE71604K]. Fitch Ratings has noted that non-performing loans at Vietnamese banks are generally understated. VietinBank and Vietcombank, which were previously fully state-owned, now have shares listed on the Ho Chi Minh Stock Exchange , but neither has a strategic foreign investor.